Dr. Haynes chose pediatrics because she knew that she would be able to enjoy her interactions with children over several decades, watching them mature and grow from a baby into an adult. She is married to a recently retired high school teacher in Wichita. He is the main reason that she moved to Wichita and joined Mid Kansas Pediatrics. One of her most enjoyable hobbies is being an amateur conformation show dog handler with her dog, a Samoyed. She also likes working with her dog on obedience and agility. Her parents moved to Wichita several years ago and it has been a blessing to have them so close. Her perfect day would be spent at a Disney park with her husband, leisurely enjoying rides, shows, and dinner, capped off with a spectacular firework display. 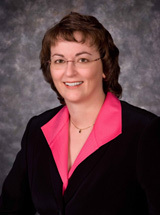 Dr. Haynes graduated from Texas Tech Medical School in 1991 and completed her residency at Willford Hall Medical Center in 1994. She joined Mid Kansas Pediatrics in 2003.